For 50 years, The Institute of Education’s weekly grinds have been preparing students for the Leaving Certificate. 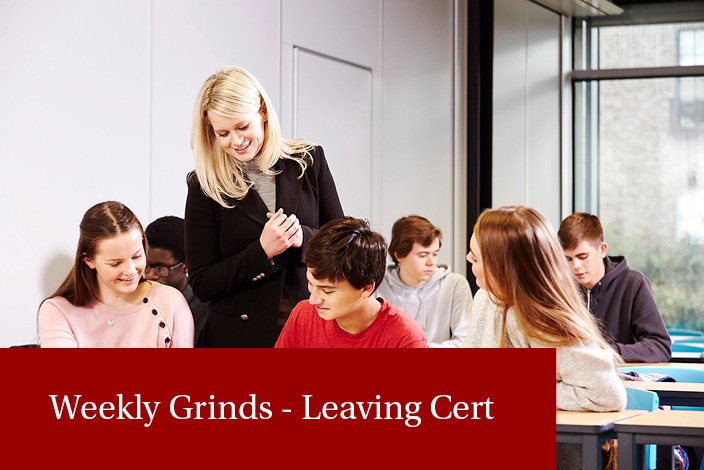 These 6th year grinds, taught by our experienced and skilled teachers, help students to improve their exam grades by improving subject knowledge, addressing problem areas and boosting confidence. The Institute of Education is now offering weekly grinds in two new locations in South & North County Dublin. Classes take place on the IADT campus in Deansgrange, South Co. Dublin, and on the Marino Institute of Education campus on Griffith Avenue, Dublin 9. With the same expert teachers, comprehensive notes and superior learning environment, these new locations allow our students to experience our unrivaled standard of teaching closer to home. Maths (Ordinary) – Revision – an intensive course 7 week course designed to help students achieve their very best in Ordinary level Maths. Course commences Saturday 23rd March, students may join the class after the course commences. Any of our weekly grinds can be sampled for one week free of charge. Advance booking is required. Please contact our office on 01 661 3511 for further details. Each Class is 1.15 hours in duration. Click on the subject name below to discover the topics being covered. Examination Techniques: How to answer questions, manage time etc. are dealt with in all subjects. The course will focus on continuous practise of likely Leaving Certificate Accounting topics with particular emphasis on the marking scheme and how students can maximise their grades in the exam. Time will also be invested in studying the Theory section of the course, which is essential if students are hoping to achieve an A grade in the exam. Handouts, with full solutions, will be given for all Leaving Certificate higher level Accounting topics going back over 20 years will also be provided. These classes cover nine out of ten topics from the Leaving Certificate Applied Maths exam (students only have to answer any six). Emphasis is placed on understanding the methods required to answer each type of question on the exam. Comprehensive notes are provided on all topics, along with fully worked solutions to all questions. As many students taking these classes are not studying Applied Maths in their own schools, we offer a homework option. Each week, students are given a set of exercise questions which they can submit the following week. Any student who chooses to submit their attempts have these fully marked and returned. This course covers all aspects of the Leaving Certificate Biology syllabus for both Higher and Ordinary levels. The course is divided into twenty discrete topics. Once the subject matter has been studied past exam questions are set for homework. These are then corrected according to the official marking schemes. A quick revision test is given at the end of each topic and a more extensive test is given after five topics have been completed. This allows the student to monitor their progress and take remedial action where necessary. The practical aspects of the course are examined in great detail and the reasons for various procedures are explained. Students are encouraged to participate actively in class by asking questions and taking notes. If a student cannot attend a particular class they have the option of taking that class at an alternative time of their choosing. All notes are made available to students with genuine reasons for absences. 1) People in Business – Examining relationships between key stakeholders, such as investors and entrepreneurs or employers and employees. It also examines the Law of Contract. 2) Consumers Laws – Focuses on Consumers laws, such as the Consumer Protection Act 2007 and the Sale of Goods and the Supply of Services Act 1980 and the relationship between retailers and consumers. 3) Industrial Relations – Deals with employer and employee relationships in detail, looking at trade unions and industrial disputes and how to solve them in the LRC/WRC and the Labour Court. It looks at unfair dismissal and discrimination. 4) Enterprise – Looking at the entrepreneurs characteristics and skills and the notion of intrapreneurship. 5) Introduction to Management – Which looks at the characteristics of a manager and how managers and entrepreneurs differ. 6) Management Skills 1 – Looking at the skills of Leadership and Motivation (It also looks at the issue of Delegation). 7) Management Skills 2 – Examining the skill of Communications and the business documents. It also focuses on the area of ICT. ICT stands for Information Communication Technology. 8) Management Activities – Focuses in detail on the 3 management activities a) Planning, b) Organising and c) Controlling. 9) Human Resource Management – Looking at the 6 functions of a HR manager, a) Manpower Planning, b) Recruitment and Selection, 3) Training, 4) Performance Appraisal, 5) Rewards and 6) Employer and Employee relations. 10) Change – Focuses on modern business techniques and systems, 1) Teamwork, 2) Total Quality Management, 3) Empowerment and 4) ICT. It looks at modern facilitating mangers and the strategies to introduce change into your business. 11) Taxation – Focus on tax calculations and the major taxes a business is liable to pay. 12) Insurance – Examines the principles of insurance and risk management. It looks at the different types of insurance a business can use to financially protect itself. 13) Finance – Looks at the types of short term, medium term and long term finances available to a business. It also has Cash Flow Forecast analysis and calculations. 14) Ratios – Student must be able to calculate 6 major accounting ratio and interpret the results. 15) Identifying Opportunities – Looks at internal and external methods to generate new business ideas. 16) Marketing – Looks at market research, market segmentation, target markets, marketing strategies and the marketing concept. 17) Product and Price – Examines the first two elements of the marketing mix, Product and Price. 20) Expansion – Focuses on the reason why a firm will expand and the organic and inorganic methods of expansion. 21) Getting Started – Looks at the finance again (how to get money to set up your firm), production options (job, batch and mass production) and Business Plans. 22) Business Scene – Looks at the primary, secondary and tertiary sectors of the economy. 23) Business Organisations – Looks at the 9 organisational structures 1) Sole Trader, 2) Partnerships, 3) Private Limited Companies, 4) Public Limited Companies, 5) Alliances, 6) Franchises, 7) Co-operatives, 8) Transnational companies and 9) Semi State Bodies. 24) Ethics – Examines business ethics and business social responsibility. 25) Government and the Economy – Looks at Government role in the economy and how it’s affects businesses and the 6 economic variables, 1) Taxation, 2) Unemployment, 3) Inflation, 4) Exchange Rates, 5) Grants and 6) Interest Rates. 26) Community Development – Looks at how to develop urban and rural disadvantage area and the agencies that assist in the development of these regions, such as Area Partnership Companies, Leader Programmes and County Enterprise Boards. 27) International Trade – Looks at trade, balance of payments, trading blocs and the opportunities and challenges firms face in international trade. 28) Globalisation – Looks at the idea of globalisation and its impact on Irish firms, global adaptions to the marketing mix and transnational companies and their impact on economies. 29) European Union – Examines the benefits and challenges of the EU to Irish firms, it focuses on the EU institutions and decision making process of the EU and the Common Policies of the EU, such as the common agricultural policy or the common competition policy. This course focuses on all aspects of the Chemistry syllabus with particular emphases on common areas of difficulty. Topics are examined through the prism of exam technique and the past exam papers. Students will be instructed on how to use their knowledge in the appropriate fashion to maximise their marks in the exam. Chemistry practicals will be discussed in detail, again making use of exam papers. – Bohrs Theory review, periodic table trends etc. The aim of this course is to provide insights for the students into the ancient Greek and Roman worlds through the study of literature, philosophy, architecture, art and the politics of those ancient races. Detailed notes are provided on all topics. Weekly obligatory homework, which comprise of essays based on examination questions, are set. A test is given at the end of each month at least and mini-tests are also devised for the students on other days. All students are encouraged to sit the Mock Examination in this subject in March. A revision of all aspects of the course is conducted in the final weeks of the academic year. – What is Economics about? – How much government involvement should be there? This class is designed to give 6th Year students a comprehensive understanding of the coursework that is set for examination in Leaving Cert Higher Level English 2019. Students are taught how to identify the key features of writing in the Language of Narration, the Language of Argument and the Language of Persuasion. Students are shown how to use this information to both analyse Reading Comprehension passages and structure and write compositions and functional writing (QB) creative writing exercises. Comprehensive notes will be provided on Macbeth (note: this is the only Central Text dealt with in this class). The poets covered are TBC. The Comparative section is dealt with through analysis of the modes set for examination in 2019, which are Theme or Issue, General Vision and Viewpoint and Literary Genre. Notes and model answers will be provided on all sections covered. Note: Students are free/ encouraged to discuss any difficulties or problems encountered in English with the teacher. This course covers all the four competencies necessary for success in the Leaving Certificate: Aural, Oral, Reading and writing. Each class focuses on all 4 competencies; however, the first half of the year aims to develop the student’s confidence in using grammatical structures. The second half of the year seeks to apply the gains made in the first three months to Leaving Certificate syllabus. While the content is similar to the fifth year course the complexity of the material covered is designed to reflect the demands of the Leaving Certificate. Students who join the class will be able to improve their preparation for the Leaving Certificate Geography exam. – Covering the main topics that make up the course. This will begin with Physical Geography, continuing with Regional Geography and finishing with the Elective and Option Units. – Practising the Geographical Skills components of the course. This will be done throughout the year with part of each class set aside to allow for this, e.g. ordnance survey, aerial photograph, graph interpretation, statistical interpretation, etc. – Developing and improving exam answering techniques. Students will be advised on how to improve the content of answers and the timing of these answers. There is a particular focus on the practical reality of an exam. This will reduce the stress of exam preparation. Students only study one Elective Unit: Both Units will be covered. Students need only study the elective covered in their own school. Students only study one Option Unit. The large majority study the Geoecology Unit. Students studying other Options will be facilitated. This course concentrates on enabling students achieve their maximum potential in their Leaving Cert German exam. We concentrate on the four main skills tested in the exam, offering ongoing homework and oral support throughout the year. The classes are exam focused and also focus on building the students confidence in the language. – Oral work with special emphasis on the Leaving Certificate oral format; general questions, role play, picture sequence or project work. – Option to discuss a film or novel in the oral will be covered. – Aural comprehension practice using CDs and authentic listening material, with a major emphasis on listening skills required for the Leaving Certificate aural test. – Letter writing, short essay and opinion of issue practice. Students will receive clear and concise revision notes as well as sample answers on selected topics. The marking scheme will be explained and essay-writing skills demonstrated. Topic 1: Dictatorship and Democracy in Europe, 1920-1945. Topic 2: The United States and the World, 1945-1989. Government, Economy and Society in the Republic of Ireland, 1949-1989. Topic 4: Sovereignty and Partition OR Northern Ireland, 1949-1993. (Please note, the most popular topic from Topic 4 will be chosen). The home economics course covers the theory section of the syllabus using very precise notes. The core areas of food studies including nutrition, consumer studies & resource management and social studies are covered in detail. One topic from the elective (20%) section of the course is covered towards the end of the year. Past exam questions linked to the area being studied are explored and analyzed in each class, providing a valuable insight into how the marking scheme is applied. Answering techniques and level of detail required to ensure success form an integral part of the course each week. – Food studies – food additives, preservation, food legislation, food safety and hygiene, meat. Textile studies. The weekend classes cover all areas of the Leaving Cert exam with weekly guidelines on the Oral and Aural sections, which combined cover 50% of the entire exam. Students will benefit enormously from the sample answers in all areas of Poetry and Prose, with significant emphasis on exam technique which will maximise their grades. The Ceapadoireacht section in Paper 1 puts great emphasis on basic grammatical skills which are covered in every single class during the 29 weeks. The course fully prepares the student to face the examination with the confidence to attain a high grade. – Scrudu Beil. Failtiu / Sraith Pictiur / Aithris filiochta / Comhra Ginearalta. The Higher Level maths course covers all the essential methods, formulae and procedures required for success in the Leaving Certificate maths papers. The emphasis is on the understanding of the methods and on the application of these methods to practical problems. Also stressed is the ability to recognise appropriate methods when presented with new looking questions. Comprehensive notes are presented on a weekly basis. Fully worked solutions are provided with a huge number of examples. While time is at a premium during class, students are more than welcome to approach the teacher at the end of class with any issues they may have. This class is designed for students whose ambition is at least a H3 in the Leaving Certificate Higher Level maths exam. As with the standard classes, students are provided with comprehensive notes on all topics. These notes include fully worked solutions to all exercise questions contained in the notes. The difference between the standard classes and the fast paced class is that in the latter, more time is spent on more challenging questions and methods, and a little less time on the more basic procedures. However, the topics are covered at the same rate in all classes. In all classes, students are encouraged to ask questions when issues arise. This can only be of benefit to all students. Achieving a higher grade though exam technique. The classes in physics will cover all material on the Leaving Cert syllabus. A strong emphasis is placed on the Leaving Cert exam and this is greatly helped by constant reference to past paper questions. Students receive guidance in how to study physics and how to prepare for examinations. How to correctly read examination questions and how to “answer what was asked” are vital student skills that the teacher helps to develop. The classes are taught in a friendly, relaxed and structured manner that is conducive to understanding the principles of physics. The clear understanding of these principles enables the students to tackle problems with confidence. Detailed notes are provided on all topics. The notes are written in a style that students find easy to follow and understand and at the same time the notes meet with the requirements of the higher level Leaving Cert. Fully worded solutions are provided for all past paper questions dating back to 2002, the first year that the present syllabus was examined. – Mechanics 1: linear motion, Newton’s laws. – Mechanics 2: moments, circular motion, planetary motion, S.H.M. This course operates in a manner that places more responsibility on its students to engage with content and concepts than a traditional ‘grinds’ environment. Central to its specifications are the theories of 16 Key Thinkers, who range from Political Philosophers like Thomas Hobbes, John Locke and Karl Marx, to modern Feminist thinkers such as Sylvia Walby and Martha Nussbaum. Handling supporting data and integrating relevant contemporary case studies from home and abroad form the backbone of the course content. This is supplemented by a detailed examination of national, international, and supranational institutions, treaties, and Non-Governmental Organiations. In addition to traditionally examined materials, the subject also includes an “Active Citizenship Project” worth 20% of the students’ final grade. This revision course offers guidance on the projects, but they will not be undertaken within this structure. In this course there is a strong emphasis on grammar. Having benefited from this important foundation the students will then be in a position to tackle with confidence the areas of the Oral, Aural, Reading and Written sections of the Leaving Cert exam. During the course the students will work with past exam papers and will become familiar with the format of the exam. – General overview of the exam paper. – Key grammar points. Sentence building. – Reading Comprehension: Strategies and key vocabulary. – Oral work on role-plays and interview preparation. – Writing techniques for Dialogue construction and Formal letters, Diary entries and Notes. – Aural comprehension: Strategies, vocabulary for the weather report and practice with past exam papers and mock exams. – Work on common errors. – Advise for the exam. Time management. * The oral component of the syllabus is dealt with in detail as part of this course. ** Fast paced Maths is for students expecting to achieve at least a grade H2 in LC June 2019. *** All students registering for Politics & Society must already be studying this subject in one of the ‘Phase One’ or ‘Phase Two’ schools. Please note: Fees reduce on a weekly basis throughout the year. Q: Am I entitled to the notes from the weekly grinds that took place before I joined. A: No, you are only entitled to the notes from the time you join the classes. Q: If I am doing weekly grinds, can I change my choice of subject or class-time during the year? A: Yes, but an administration charge of €20 will apply. Q: Can I sample a class to see if I like it? A: Yes, any of our Junior or Leaving Cert weekly grinds can be sampled for one week. The fee per subject is €30. Q: How much is the fee per class? A: This depends on the number of subjects taken. Q: How many weeks of tuition are there in the weekly grinds course? A: There are 29 weeks of tuition. Q: If I start weekly grinds later in the year, will this be reflected in the fees I pay? A: Yes, fees are calculated on a pro rata basis. Q: Is attendance at weekly grinds and part-time courses monitored? A: Yes, students are required to sign a roll sheet at each class they attend. The Institute however accepts no responsibility for students who fail to report to class or who fail to sign the attendance sheet. Q: Are there any breaks or holidays during the year for students attending weekly grinds or part-time courses? A: Yes, there are breaks at mid-term, Christmas and Easter. Full details are on our website. Q: Is there somewhere for part-time students to study if they have a gap between classes? A: Yes, there is an unsupervised study room set aside for this purpose. Q: Are Supervised Study facilities available to part-time students? A: As part of an annual early booking offer, supervised study is offered, free of charge, to 6th Year students attending our weekend grinds. Full details of this offer are available during the summer on our website. Q: Can a 5th Year part-time student join a 6th Year class if the subject is not available at 5th Year level? A: Yes, if they join the 6th Year class at the start of the Academic Year. Consideration must be given to any changes in curriculum. 4th Year students can join certain 5th Year classes provided they are not struggling with the subject, and again consideration must be given to any changes in curriculum. Q: Can part-time students take up an extra subject or a subject that is not available to them in their own school? A: Yes, with consideration being given to the suitability of the subject. It is advisable that students take on a new subject at the start of the academic year. Our 6th Year programme covers each subject in full. However 5th Year students can join our 5th Year class and complete the subject over two years. Q: What subjects would you recommend to take on as an extra subject? A: The most popular subjects would be: Applied Maths; Economics; Business; Accountancy; Classical Studies. An extra science subject can be taken: Physics; Chemistry; Biology. Laboratory practicals are available, subject to demand. Q: How many students will be in the class? What is a typical class size? A: Class sizes vary depending on the demand for each subject. Class numbers can increase as the year progresses, however this does not have a negative impact on the excellent standard of our teaching. Q: For weekly grinds, does the beginning of a new term mean the start of a new course? A: No, in the weekly grinds each subject commences in September and runs through to the end of the academic year in May. Students can catch up with what they might have missed by participating in the Christmas, mid-term and Easter courses. Q: If I want to join weekly grinds during the year, can you tell me what remains to be covered on the course and what the student has missed? A: No. Teachers have their own individual teaching plan for the year. However, students can do a sample class and enquire from the teacher.